Zoe Werner at April’s Words Out Loud. April’s WOL fell on Easter Thursday, and there were many good words — and chocolate eggs! Bounce back to the night with this selection of performances. 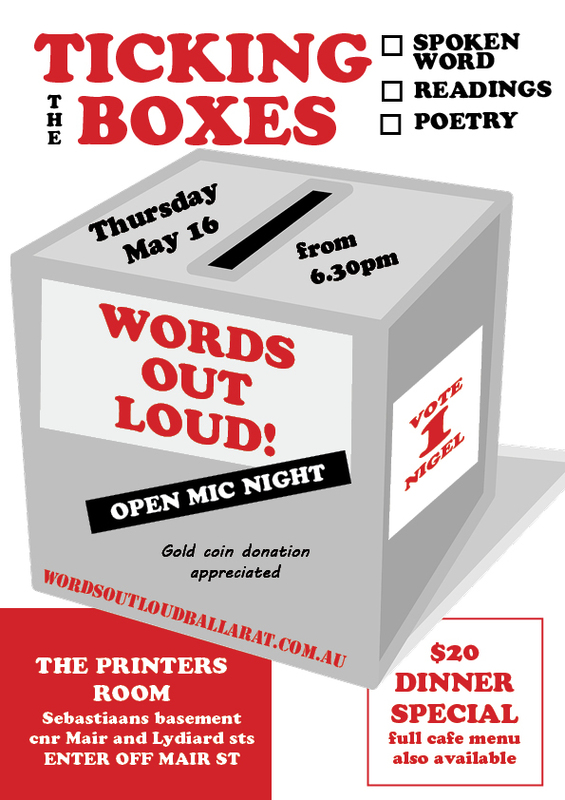 In May we are ‘ticking the boxes’, on the 16th, only two days before the federal election. Vote 1 spoken word! Scott Woodard at April’s Words Out Loud. Now that the official program is out, we are pleased to announce that Words Out Loud will be appearing at Clunes Booktown festival! Performers from the Ballarat region (and one ring-in, who has graced our stage before) will be sharing short pieces of poetry, fiction and memoir in a free event at the Petanque Stage on Sunday 5 May, 10-11am. Not a bad way to start off your morning before some serious book browsing and partaking of literary inspiration! And if you’re at Booktown on the Saturday, 4 May, keep an eye out for WOL co-convenor Kirstyn McDermott, sharing insights about Victoria as a state of writing with Tony Birch, Alicia Sometimes, Josh Pomare and chair Michelle Scott-Tucker. That’s a ticketed event in the Town Hall at 2.30pm. Share the word with our Facebook event. Part of the World Poetry Day crowd at Words Out Loud. 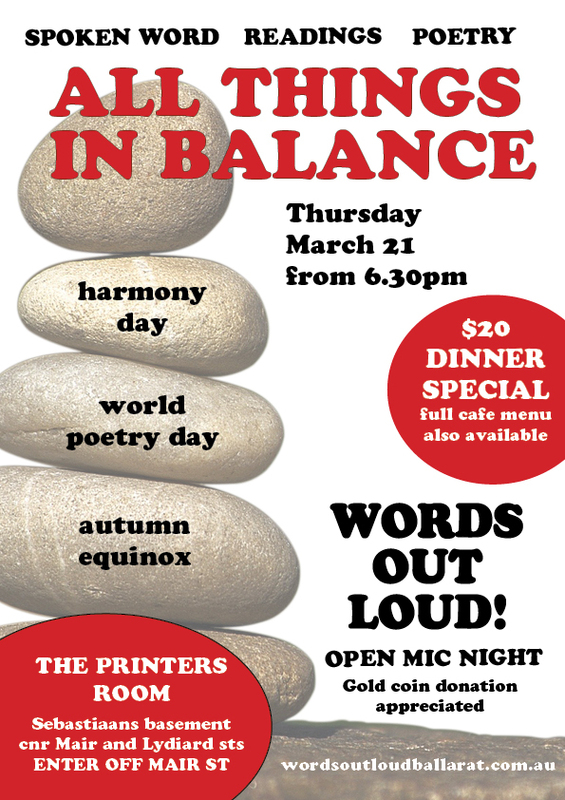 The confluence of World Poetry Day, the autumn equinox and Harmony Day inspired March’s theme of “all things in balance”, and what a big night it was. Here is a smorgasbord of the night’s offerings — seventeen morsels of flash fiction, poetry, memoir, and extracts, each up to five minutes. Tasty! Hear more live, when we get the jump on Easter with the April edition’s theme of “hop to it” on the 18th! Find out more here. 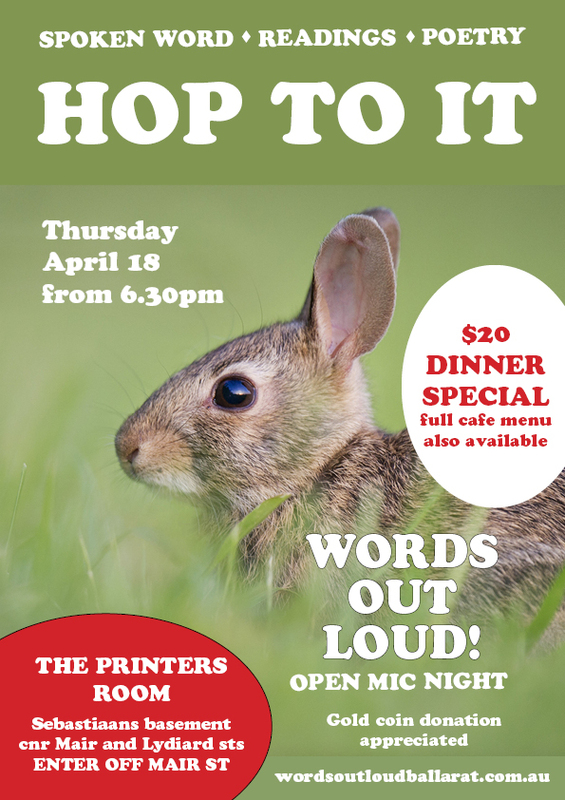 Words Out Loud is “hopping to it” for our Easter Thursday edition. Wordsmiths are invited to respond to the theme — or ignore it altogether. A comfortably full house was on hand to hear a packed program pull at the heart strings at February’s edition of Words Out Loud. A selection of the performances is now available for your listening pleasure. Thirteen morsels of flash fiction, poetry, memoir, and extracts, each up to five minutes. Tasty! Hear more live, when we mark the confluence of the autumn equinox, World Poetry Day and Harmony Day at the March edition on the 21st!